The term cyber warfare is becoming increasingly common in mainstream media, on the political stage and in military circles. To many it will appear as if the world has been caught unaware by the rise of cyber warfare and its impact on global society. In reality, research on cyber warfare in the form it is known today dates back to the 1980s. 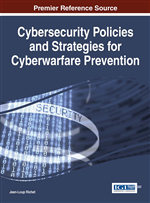 This chapter presents cyber warfare from the perspective of the research community. It highlights current research into eight distinct areas of cyber warfare, and examines the arguments, agreements and disagreements between various authors in each field. The chapter is organised into sections, with each section providing background and analysis into a particular area. The United States Department of Defense defines cyber warfare as “an armed conflict conducted in whole or part by cyber means” (Giles & Hagestad, 2013). This short and simple definition of the term can arguably obscure the fact that the topic of cyber warfare is a complex and multi-dimensional one. Looking beneath the surface of cyber warfare, issues of politics, social, legal and technical dimensions present problems that the cyber warfare research community has been working to address. The aim of this chapter is to look beyond the surface and dig into these complexities, providing an insight into the research problems they present. Due to the scale of the research landscape, the scope of the chapter is designed to provide a concise overview of each topic, without being an exhaustive compilation of all research. In this regard, the chapter should be considered as an introduction to the state of the art and as a resource from which further research can be launched. Eight significant cyber warfare topics are presented, along with discussion of the views and contrasting arguments of researchers within each. A visual representation of how the topic of cyber warfare is constructed is shown in Figure 1. Any activity that has the potential to cause harm is subject to ethical considerations and cyber warfare is no exception. Responsible practitioners of cyber warfare wish to act in an ethical manner, just as they do in traditional, kinetic warfare. Irresponsible practitioners may not have the same internal drive to act ethically, but the ability to concretely identify actions that violate agreed ethical guidelines is essential in highlighting wrong doing on the international stage and holding perpetrators responsible. There is currently no set of ethical guidelines for cyber warfare, which has led to a number of researchers performing work into how such guidelines could be created and what they may consist of. Jus ad bellum: When is the use of warfare ethically justified? Jus in bello: How does one conduct warfare ethically? Proportionality: Attacks should not cause excessive harm beyond what is needed to achieve an objective.